If the torque converter stator's one way clutch is suspected of slipping or being seized, a torque converter stall test should be performed before bench testing the converter. Always check with the vehicle’s manufacturer before performing this test. To perform a stall test install a tachometer, chock all four wheels, and set the parking brake. Make sure the tachometer is viewable from the driver’s seat. Place your foot firmly on the brake pedal, and place the transmission’s shift selector in Drive. While holding the brake pedal, press and hold the throttle pedal to the floor for 2 or 3 seconds. Always check with the manufacturer’s recommendations, because this test places stress on the transmission. Never exceed 5 seconds. Compare the reading (stall speed) on the tachometer to the manufacturer’s specifications. 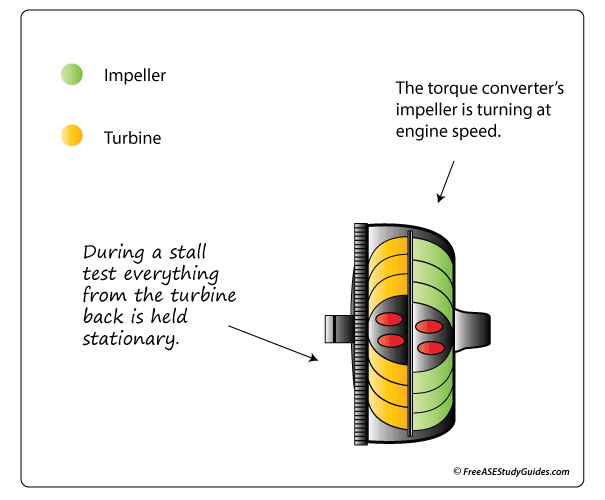 During a stall test, the torque converter’s impeller is spinning at maximum speed while the turbine is being held stationary. Since everything from the turbine back is held stationary, a vibration like an out of balance drive shaft would not appear during a stall test. An out of balance driveshaft causes a vibration that increases with vehicle speed, not while it sits stationary. If this reading is below specifications, the torque converter’s stator one way clutch is spinning freely or there is a restriction in the exhaust system. If the reading is above specifications, the transmission’s clutches and bands are slipping.